In honor of National African-American Heritage Month our staff take a closer look at Earl School in Las Animas county. Earl School - Las Animas County. The Earl School welcomed the students of Earl for 37 years, beginning in 1909, and was the only local venue available for social functions. Earl School served African-American students of the so-called “Black Colony” as well as Hispanic students. It is a good example of a one-room adobe schoolhouse, built for functionality using locally available and inexpensive materials. The Earl School relates to the historic context outlined in Rural School Buildings in Colorado (http://www.historycolorado.org/content/rural-school-buildings-colorado). Many children from an African-American farming community located near Earl, toward Alfalfa, attended Earl School. Alfalfa did not have any commercial services or a school. African-American rural farming colonies in Colorado are rare. Contemporary scholarship reflects only two such colonies on Colorado’s eastern plains, and none mentions the one in the Earl vicinity or any others in the remainder of Colorado. Prior to this nomination, only two documented African-American rural farming colonies in the state were known. 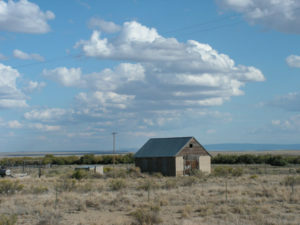 The National Register-listed Dearfield townsite is located in Weld County in northern Colorado and “The Dry” was near Manzanola in Otero County, approximately 75 miles northeast of Earl. An article in the Trinidad Picketwire newspaper for October 11, 1921, reveals the extent of the African-American colony established at Earl. Secretary Inglis of the Chamber [of Commerce] brought up a matter which had been presented previously by the chamber by W.E. Martin, well known colored of the colony at Earl. Martin who was formerly a steward at the Trinidad Club believes the Earl colony should get as much recognition from Trinidad as the Dearfield colony does from Denver. It was brought out there were 40 to 50 families at Earl owning 8,500 acres between them and that all the money for their needs is spent in Trinidad. While no financial assistance was asked for, the colony is anxious to obtain the moral support of Trinidad’s business interests and urged Trinidad to advertise the advantages of the Earl colony for the colored people of the country. At the present time the colony is without a colored school or church. These two institutions are needed badly. Little documentation has been found regarding the colony’s establishment, except that it did not begin until after the turn of the twentieth century. The U. S. Census records confirm that many of the known African-American families arrived between 1910 and 1919 with several families leaving the area by 1930. While some relocated to the Model or Trinidad area, others returned to the states in which they lived prior to coming to Colorado. The Office of Archaeology and Historic Preservation’s Heritage Diversity Initiative seeks to celebrate the historic places significant to people of every language, culture, and background that comprise the Colorado story. Check out the growing list of historic places, including those related to African-American contributions to American history, at: www.historypin.org/en/person/75043. Submit your own story as well: www.historycolorado.org/oahp/heritage-diversity-initiative.